A portal is considered a shortcut, a guide, a door into the unknown. Now, If only portals actually existed… However, it turns out that they do, and NASA-funded researchers at the University of Iowa to figure out what was going on. In the last couple of decades science –or better said mainstream science—has tried to adapt to numerous claims, features, and characteristics that have previously been considered as unacceptable. Breakthroughs and countless discoveries have altered science as we know it like never before. While many researchers reject new ways and new concepts, other researchers around the globe are embracing the fact that in order for science (in general) to advance and make even bigger breakthroughs, we must let go of the strict dogmas set into place decades ago. The reality is proven to be a very complex concept that has the ability to change our perception of life, our planet, solar system, known physics and the possibility of alien life. While many of these subjects have been part of countless conspiracy theories, people on Earth have come a far way in the last decade in our quest to understand the secrets of the universe. It turns out there are ‘hidden portals’ in our planets Magnetic field.Scientifically speaking, a wormhole is a ‘hypothetical’ feature in space-time that primarily acts as some sort of a shortcut through the universe. This has been featured in numerous science fiction movies and accepted as a possible way of travel of aDvanced Extraterrestrial beings which (possibly) inhabit other parts of our universe.Science tends to agree and disagree on this matter. While many believe wormholes, portals, and shortcuts in the cosmos are most likely possible, others firmly reject that notion saying it’s all part of science fiction. Interestingly, Science Fiction has made numerous new technologies a possibility. Things that were considered as science fiction half a century ago are today’s reality. An example of how science fiction turns into a possibility is a discovery NASA Made in Earths Magnetic field as they have discovered there are hidden portals there. 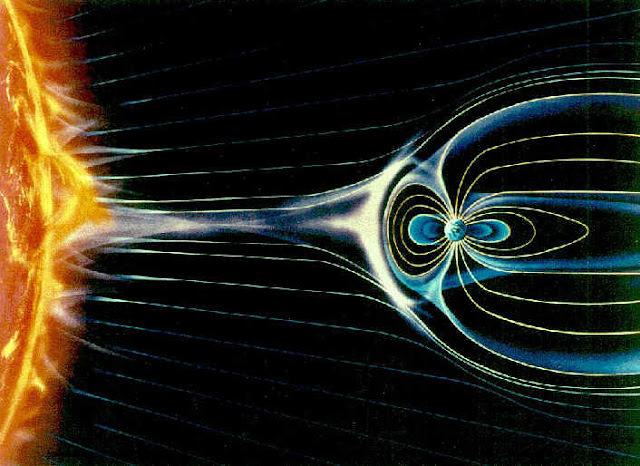 In fact, there are certain areas in Earths magnetic field that is connected with our Sun’s magnetic field, meaning that this allows for an ‘uninterrupted’ path that leads from Earth to the Sun, located some 93 million miles away. In order to make the discovery, NASA used its THEMIS spacecraft which examined the phenomenon. According to NASA, the strange portals open and close several times a day.Strangely, UFO hunters have claimed for years that our sun is part of a gigantic Star Gate used by ‘Gods’ or highly advanced extraterrestrial civilizations to travel across the universe rapidly. According to research,m the portals NASA discovered are mostly located tens of thousands of kilometers from Earth, and some of them are small while other gigantic, vast and sustained. According to scientists, these portals transfer massive amounts of magnetically charged particles that originate in the sun. There are many unanswered questions: Why do the portals form every 8 minutes? How do magnetic fields inside the cylinder twist and coil? Magnetic portals are invisible, unstable and elusive. They open and close without warning, and there are no signposts to guide in – Dr. Scudder, University of Iowa.